Chatbots are featured on just about every company’s website these days. Across industries, businesses are eager to use chatbots to help their customers and reduce the costs of support. But what we’ve seen with first-generation chatbots leaves a lot to be desired. More often than not, chatbots just don’t seem up to the task. 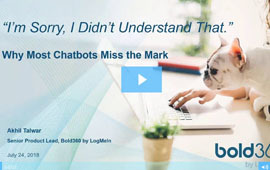 Customers ask simple questions that bots often don’t have the answers to, and they are left having to make a dreaded phone call to customer support. Is artificial intelligence really not all that intelligent?